Final Fantasy 15 has a big open world, and it can be overwhelming when you first start. 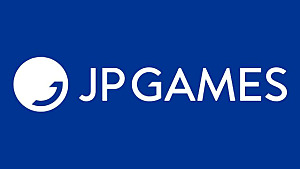 There are side quests galore, story content, several things to do in battle, skills like fishing, and more. If you are just getting started and don't know about a lot of what's in the game, I got you covered. 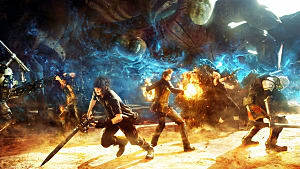 There are some things that are not apparent even after going through most of the game, so be sure to check this out even if you think you have a firm grasp on what Final Fantasy 15 has to offer. Combat Basics - What you need to know about the battle system. Gear and Stats - What you can equip and what each stat does. Map - How to read it and what you can do with it. Ascension Board and Elemancy - How to strengthen your character and use magic. The fights are real-time, meaning you don't take turns to perform actions like in many games in the series. There are 2 modes of the battle system -- Active and Wait. Active allows you to fight uninterrupted and is suited for people that like a more action-oriented game. Wait allows you to stop time while you lock on an enemy to scan it. This will bring u p their strengths and weaknesses, so you know how you should attack.It also stops time while you stand still to give you time to come up with a strategy. There is a timer, so you can't wait forever. This mode is for people that like to take it slow and plan out each attack. Warp allows you to teleport a short distance in front of you. Locking on to an enemy will perform a Warp-strike when you press the Warp Button. 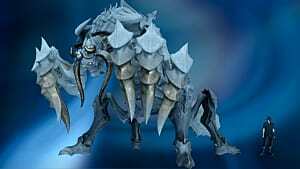 This teleports to the enemy with an attack. Phase allows you to swiftly dodge attacks and come back with a counter-attack. 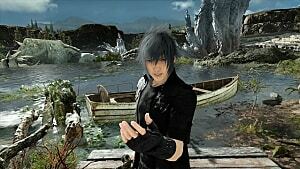 Noctis can use any weapon, and hold 4 at a time. You can use the d-pad to switch to any of these 4 while in battle. You can also bring up the menu and switch any of these at any time, even during battle. You cannot switch the one you are currently using while in battle. You can even craft magic using Elemancy while in battle, more on that later. 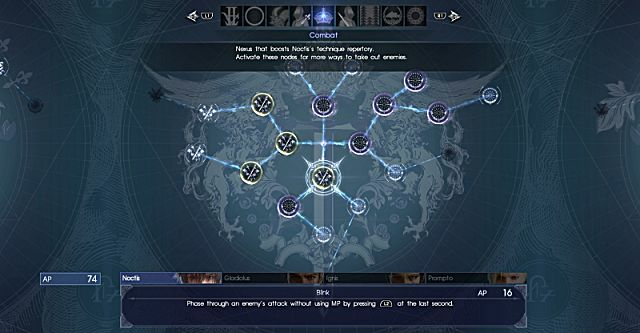 There are also Techniques and Teamwork features you can do with the other members of your party. 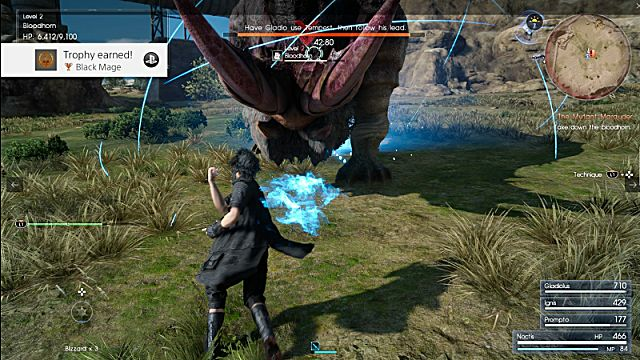 Each party member, besides Noctis, has a Technique they can equip. You do this from the gear section just like weapons and accessories. Each member has multiple techniques they can learn, but can only equip 1 at a time. While in battle, you will fill up your Tech bar over time. This is a green bar on the left of the screen and is required to perform Techniques. Press the Technique button while in combat to bring up your party members' techniques. 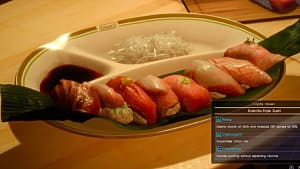 Select the one you want to use, as long as you filled the bar up enough, and your party member will perform that Technique. You can get bonus damage from hitting an enemy from behind, this is called Blindside. You can also cause a target to become Vulnerable when hitting certain parts, or using certain attacks. Sometimes, party members will perform Link Attacks with you when you hit from Blindside, or on vulnerable targets. Noctis can equip any weapon his friends can, as well as some only he can use. Everyone else has specific gear they can equip. Everyone can also equip Accessories and Attire. Accessories can raise stats, provide extra bonuses to abilities, block certain status effects, and more. Attire changes the clothes your character wears, but they also give bonuses to certain stats. Attack - This is the base stat for determining the damage you deal by physical attacks. Defense - This is the base stat for determining the damage you take from physical attacks. Strength - This stat increases how much Attack you get. Vitality - This stat increases how much Defense you get. Magic - This stat determines how much damage you deal with magical attacks. Spirit - This stat determines how much damage you take from magical attacks. HP Boost - Increases max health. MP Boost - Increases max MP. Resistances - There is one for each type: Fire, Ice, Lightning, Dark, and Shoot. Increasing these will allow you to take less damage from these attacks. Lodgings and Campgrounds are important because in this game, your experience is not added until you rest. This means that whenever you want to level up, you need to rest somewhere. 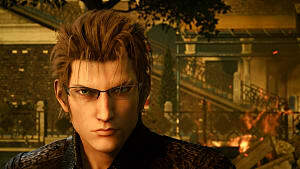 Resting at campgrounds also allows Ignis to cook something, which raises his cooking skill. Royal Tombs are for later in the story, but they are usually dungeons that allow you to get powerful weapons that only Noctis can use. Fishing Holes are the only areas you can go fishing. Rent-a-Bird allows you to spend Gil to rent a Chocobo you can ride. 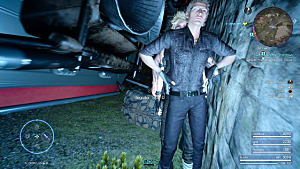 While driving in the Regalia, you can choose auto to have Ignis drive to a location. You can also choose map point and place a marker for him to drive to. He will drive to the closest point near the marker. As you battle you gain not only experience, but AP as well. You can use this AP to unlock several bonuses on the Ascension board. There are 9 total categories on the board, but only 8 available until you get further into the story. 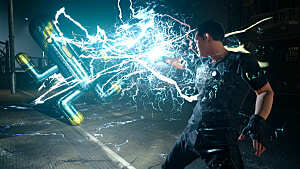 Combat - Gives Noctis more abilities and increases the strength of his existing abilities. Magic - Boosts the power of spells and allows to to gather more Magic from nodes. Recovery - Unlocks more curative options for you and your party. Technique - Enhances your party members' Techniques and unlocks new ones. Teamwork - Improves the support your party provides in combat. Stats - Increases stats like strength and allows you to equip more accessories. 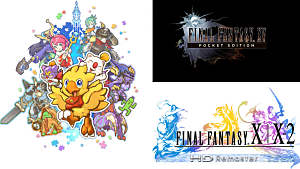 Exploration - Allows you to gain AP and experience for things like long car rides, riding chocobos, and fishing. Wait Mode - Gives more tactical options when using Wait Mode. Armiger - Powers up your Royal Arms abilities. You can also add an item while crafting to give the spell extra effects. That's everything you need to get started in Final Fantasy XV! Let me know if you have any questions!